If the Food Pyramid works for keeping Americans healthy, might an Investing Pyramid accomplish the same thing for personal finances? The food pyramid was first introduced by the USDA as a visual guide for a healthy diet. Their infographic representing recommended servings in each food category has changed numerous times since its 1992 debut and has been often criticized for being erroneous and misleading. Despite its controversy, I give credit to the USDA for its attempt at developing an easy to understand format for nutritional standards in the United States. If only there were easy to understand investment standards. After all, your financial health is a critical component to your overall well-being and no one can deny how confusing and complicated the world of finance can be for investors. Yet, the finance industry insists on keeping the average investor buried under hard to comprehend jargon and complicated terminology. This maintains a veil of mystery over commonly held beliefs on investing best practices. Unfortunately, there has been no evidence-based graphic championed by the United States government to provide general guidelines for Americans to successfully invest for retirement. If I were to offer a Healthy Investing Pyramid, here’s what it would look like. 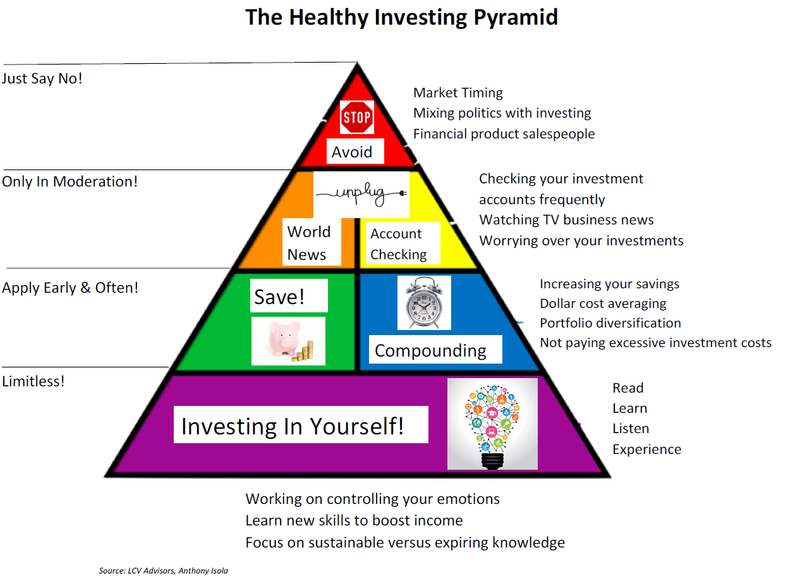 Here is what my take on a Healthy Investing Pyramid represents. Investing in yourself is one of the greatest things you can do for your personal finances. I think this is what everyone needs the most of. The more you know, the more you can do. This doesn’t mean you need to become an investment expert either. On the contrary, investing in yourself means you seize opportunities to learn new skills that can boost your income potential. It also means you learn how to plan for long-term success, not just short-term wins. 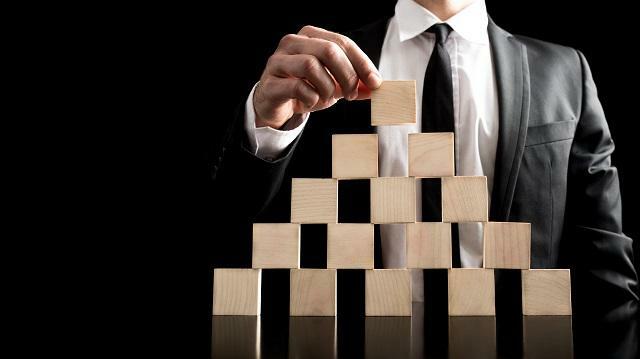 The next component of a healthy investing pyramid is building wealth. To build wealth, saving as much of your income in a diversified investment portfolio as early in life as you can is the answer. The reason for this is simple: compounding interest. Your money has the greatest potential to grow the more time it has to earn interest. And the interest your money earns its own interest, which is why saving and investing is part of a healthy investing pyramid. In moderation, being aware of what is happening in the market is OK. There is nothing wrong with tuning in to current financial events, but you likely don’t need to personalize these headlines to your personal finances. When you’re properly invested for the long-term, you won’t need to check your financial accounts daily or worry about intraday market fluctuations. At the top of my pyramid sits the things you can absolutely do without, like sugar. Sure, you may be tempted to indulge in timing the market, getting swept up in politics, or “shiny” financial products but stop yourself. You don’t need any of those things in order to invest successfully. Yet, investors can confuse these items as most important because they are often so readily available and accessible. The dramatic decline of secure pensions and mounting pressures on Social Security payouts have created a growing need for more retirement investing education. Therefore, taking the reins of your financial life is more important now than ever before. A proper investing infographic, like the one I have fashioned, can remind individuals and households to save consistently, avoid concentrating in employer’s stock, and reinforce the value of compounding interest for example. I propose healthy investing guide for all Americans, no matter your age or financial standing. These financial concepts and habits are timeless and have the potential to minimize investment mistakes and build wealth over time.